Revolutionary Whey Protein Muscle Food! This is it; the expertly formulated, low carbohydrate, lean muscle food expressly developed for serious athletes. No fluff, no low grade protein – just a revolutionary blend of key ingredients to help build and preserve slabs of lean muscle. 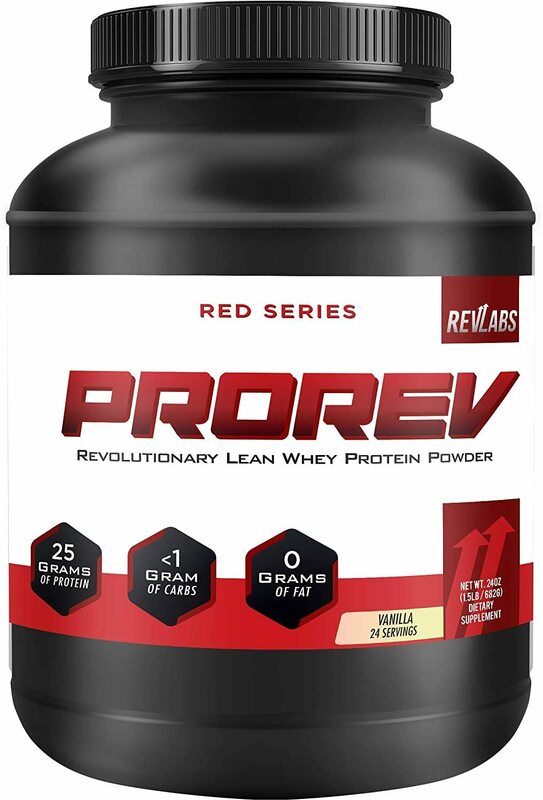 PROREV delivers two forms of premium whey naturally rich in bioactive fractions and muscle-preserving BCAAs. For next level support, our formulators “hyper-loaded” PROREV with additional Glutamine, Glutamine Peptides, and Amino Peptides for even more muscle-generating power. PROREV is an expertly formulated, low carbohydrate, lean muscle food expressly developed for serious athletes. No fluff, no low grade protein – just a revolutionary blend of key ingredients to help serious athletes build and preserve slabs of lean muscle. Our formulators “hyper-loaded” PROREV with additional Glutamine, Glutamine Peptides, and Amino Peptides for even more muscle-generating power. If you want to achieve real, lasting results, then it’s time to get serious with Fuel for Your Inner Champion. Look, your training regimen and supplement protocol is only as effective as your adherence to core nutrition. No matter how hard you train, or what type of workout supplements you use, your ability to recover and grow is seriously governed by your dietary intake. Look at it this way. Relative to a 24-hour period of time, your training session, as intense as it may be, is quite brief. The remainder of those 24 hours is spent in recovery mode, hopefully fueled with a high-performance, nutrient-dense diet. After all, training is for muscle stimulation…recovery is for promoting an anabolic environment that allows growth to happen. Proteins are constructed of the very “building blocks of life” themselves, amino acids. It’s these amino acids, the embedded “diamonds” in proteins, which are responsible for supporting an incredible range of physiological benefits. Most notably, amino acids provide the “brick and mortar” of muscle construction. Additionally however, amino acids help construct hormones, build enzymes, form neurotransmitters, support energy, and much more. To help target the timing and volume of their amino acid intake, serious athletes often turn to supplemental forms of protein. For them, the “gold standard” is whey, a highly digestible, bioavailable, and bioactive powerhouse of muscle food. Additionally, whey protein is loaded with the Branched Chain Amino Acids; three unique aminos that support muscle energy, muscle protein preservation, and new growth. Prorev-ProteinNow, let’s just cut to the chase. All whey protein products are not created equal; there are mediocre products, there are decent products, and there are good products. However, there can be only one “best” whey protein product. The way we see it, that title goes to PROREV, only from Revolution Laboratories. PROREV is an expertly formulated, low carbohydrate, lean muscle food expressly developed for serious athletes. No fluff, no low grade protein – just a revolutionary blend of key ingredients to help build and preserve slabs of lean muscle. PROREV delivers two forms of premium whey naturally rich in bioactive fractions and muscle-driving BCAAs. For truly next level muscle support, our formulators “hyper-loaded” PROREV with even more Glutamine, Glutamine Peptides, and Amino Peptides. These free form and peptide amino acids promote protein metabolism, immunity, muscle energy, and more. The addition of these precision amino acids catapults PROREV into the status of “super premium” muscle-building whey. PROREV was engineered for athletes who are serious enough to demand the very best protein available on the market. Are you serious about realizing your athletic potential? If so, then it’s time to get Fuel for Your Inner Champion with PROREV. Join the revolution! Proteins are constructed of the very “building blocks of life” themselves, amino acids. Prorev-ProteinNow, let’s just cut to the chase.